I used to think it was silly to believe in faeries. That was before I stumbled across a sweet little booklet self-published by Sharon Lovejoy called Faeries In My Garden. Here was a perfectly sane (and very talented I might add) adult who not only believed in faeries but planted gardens for them. If you've ever been fortunate enough to visit Heart's Ease in Cambria, CA, the shop once owned by Lovejoy, you will have experienced the magical gardens she planted there. 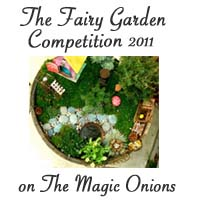 Sharon inspired me to create my own fairy gardens and to make my yard a wonderland. Due to a few years of upheavel in my family's life, all of the fairy garden implements were packed away until they could be set out to delight the faeries once again. Now that we are finally settled, my daugthers and I have had so much fun picking the spot and planning the perfect fairy garden. An ancient tree on our property was the perfect backdrop. The girls unpacked the box of fairy furniture while I painted the windows and door that Daddy cut out for us. The last time we had a fairy garden we had to purchase moss from the garden store. Living in Oregon, we have moss growing under every bush free for the taking (although we did ask permission from the moss faeries). We put the finishing touches on and snapped some pictures. As is often the case in Oregon, the sun did not cooperate for the pictures but the faeries are happy and so are we! Welcome to my garden. Come up the path and have a seat. Is that a fairy peeking out of the window? Bunny is popping her head out of the clover. Have a seat by the birdbath and enjoy the view. Until the faeries come tonight to play. WOW Carin - such a talented lady! The gardens are beautiful and I'm sure you and the girls are having a blast. I miss you guys (not that you were next door - wouldn't that be AWESOME). I'm glad to see that you feel so 'at home' in your new space. Love to you all! I just showed Casey and he said "Ahhh, they're going to fit in just fine." We all need a bit of magic in our lives! thank you for sharing yours. There'll be a line-up of faeries wanting to move in! I LOVE the picture of your fairy garden!! Too cute!! I must make one. I love this! Did you make the wooden bridge? Oh Myyyy Goodness...I absolutely adore your Fairy garden!! I think it is a MUST for us to visit this store in Cambria.. =) Miss you guys so much and all our crafty adventures! use to sing this all the time......love it!!! This is a beautiful setting for your fairy garden. I like how it is nestled in among the roots of the tree. I want to move in, beautiful, loving every little bit, especially those windows. I agree! Those windows!! I must know, did you make or purchase? Absolutely love it- especially the windows! did you make them or buy them; if the later, where? And how did you make the door? You have created the most wondrous fairy garden! I can hardly wait to try. Thank you for sharing! I am in awe of your fairy garden. Fairies are averse to any form of iron. So anything that rusts will surely keep them away. I know about the popular miniature garden items that are so perfectly proportioned for a fairy garden, but they're really just for show. There's too much iron in them. About the only metal fairies can tolerate is brass. Good luck with your garden. Thanks for sharing! : ) Thanks for the advice. Amazing fairy garden, so fun!!!! How did you attach the windows and door to the tree? I absolutely love your creativity!!!! I just nailed them into the tree. Thanks for putting together this event and all the information necessary. Hope to join next time. Where did you get the decorations? This fairy garden is completely enchanting! I got them at a little garden shop in Southern California so many years ago. I can’t even remember the name now. I made the door and windows.